The Pickering Nuclear Station on the Lake Ontario waterfront is one of the oldest nuclear plants in the world — and one of the largest. Since construction began on Pickering in the 1960s a large urban area has grown up around the station. Pickering is now surrounded by more people than any other nuclear station in North America — way more. Leaving this problem plagued nuclear station running for another decade in the heart of our largest urban area makes no sense. In fact, closing Pickering will actually save $1.1 billion in electricity costs as it has the highest fuel and operating costs of any nuclear plant on the continent. Instead of “extending” the life of this 47-year-old nuclear station, we should close it when its licence expires in 2018. By starting deconstruction of the plant immediately after closure, we can create jobs, save money and ensure a smooth transition for workers and the community. Sign the petition to close Pickering by 2018 and ask your friends and family to sign it too! We have better choices: It’s time to close the Pickering Nuclear Plant explains how we can save money, improve safety, create jobs and end money-losing export sales by closing the Pickering plant and turning to cleaner, safer options to meet our power needs. 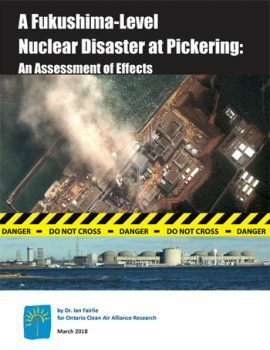 A Fukushima-level Nuclear Disaster at Pickering: An Assessment of Effects outlines the severe consequences of a major accident at the Pickering Nuclear Station, including the need to potentially evacuate 650,000 people for 30 to 100 years; 26,000 new cancer cases, half of which would be fatal; and enormous economic losses. 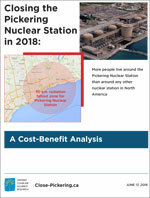 This short report outlines Pickering’s high costs,poor performance and lower cost — and safer — alternatives. Ontario has a large electricity surplus, yet Ontario Power Generation wants to continue to run the aging Pickering Nuclear Plant. This factsheet shows that much of the power Pickering produces isn’t needed and that the remainder can easily be replaced by cleaner, safer and lower cost sources. Ontario’s nuclear plants are the country’s largest source of dangerous tritium emissions and the Pickering plant is the worst of the worst. This radioactive isotope is produced — and released to the atmosphere — constantly by CANDU nuclear reactors. Once tritium is inside us, because we breathe it in, absorb it through skin or consume contaminated food or water, it release radioactivity in our bodies. 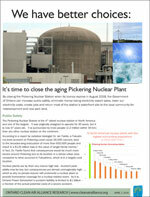 Read the factsheet on Ontario Nuclear’s Tritium Problem. 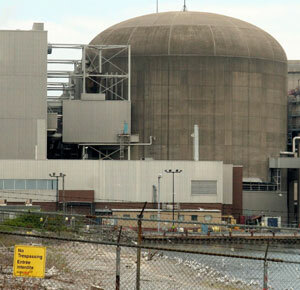 Immediately beginning the decommissioning and dismantling of the Pickering Nuclear Station after closure can create jobs and save us hundreds of millions of dollars. It is also the safest way to return this toxic site to useable green space on the Pickering waterfront. You can also watch these informative videos featuring nuclear experts who believe Pickering should be closed.